Most new CNC controls are now Ethernet capable and support Windows networking for file transfer and offer plenty of room for storage. There are, however, a huge number of perfectly functional CNC machines out there with older controls that support only RS-232 for file transmission. We also see a number of machines where the company orders them without an Ethernet port option. Many of them, especially the older machines, have limited memory. While modern CAM software provides much more complex G-codes for better speed and quality, the resulting programs can be quite large. Limited memory and RS-232 communications means you will likely need to drip feed (aka: spoon feed, dnc, buffered input), which simply means that the control buffers then processes each line of G-Code as the RS-232 system (DNC-Max, CIMCO Editor, etc) sends it. This allows a machine with a small amount of memory to run a huge program. A frequently asked question we get from customers is how do we drip feed using DNC Max (or in rare cases, CIMCO Editor) on the software side the answer is very simple, you send the same way you always would. The CNC control is actually where you need to do something differently, the machine needs to buffer and run the program instead of store it. To do this the machine must support drip feeding, thankfully most machines do but there are some that do not. So how do you find out how to setup your machine to drip feed? You can start with your manual if you are fortunate enough to have it available. Each control and manufacturer can have some very different configuration, I’ll use Haas as an example because I happen to have a Haas simulator and a manual readily available for it. The manual then goes on to tell me that XMODEM is recommended, Parameter 57 bit 18 needs to be 1 and setting 55 has to be ON. You can get the full details for your Haas via “Owner Resources” on the bottom of the page at www.HaasCNC.com. What if I don’t have my manual? Don’t fret too much if you don’t have your manual, you can probably find a manual for your machine and/or control type or instructions on how to setup drip feeding searching on Google or another search engine. Be detailed with your search terms including the control type and machine type. Some of them are easy to find, especially if the machine tool vendor provides their own control system (e.g. Haas). It is more necessary with something like a Fanuc control because there are so many and you’ll find so many different (altered) flavors on many difference CNC makes. The key is to find information that matches your machine closely enough to at least find the general area or the typical process. You can always test it with a very simple program like a warm-up routine. Drip feeding can present other challenges, especially if you’re dealing with long (or poor quality) RS-232 cables or other factors that negatively impact the quality of the communications. In some situations your programs may be quite large with many lines of code that are needed to be processed quickly to produce a quality part. It is possible that if you have had to set your baud rate low due to long cables or outside factors such as grounding issues or interference. In these cases drip feeding may not be fast enough to run a modern program well and finish quality can suffer, or worse. Tip: With DNC-Max it is possible to run a higher baud rate and effectively give you somewhere between two supported baud rates such as 4800 and 9600. Say your machine will not keep up at 9600 baud, rather than dropping to 4800 try adding a small line delay with 9600 baud. Keep in mind this is these are the maximums, the quality of the cable and environment it is located in can have a significant effect on those figures. This also means RS-232 is very susceptible to interference, whereas a very short RS-232 cable is very forgiving. 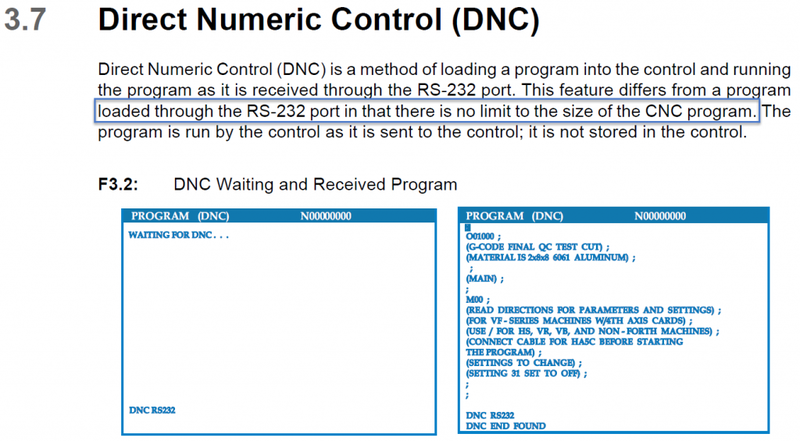 One last consideration – CIMCO Editor can DNC to machines it can communicate with using RS-232, but if you drip feed frequently I would strongly recommend DNC-Max. You may also want to review this article if you aren’t sure which product you should be using – Edit or DNC Max – Which do I need? The moral of the story here is the emphasis that each machine can be very different, so your manual is your best bet for finding the best quality data on how to setup your CNC machine for drip feeding. Drip feeding can also be nuanced with issues based beyond just what the CNC control and your software can handle. We can help you sort that out. If you need help give us a call 925-272-0384 or visit our support page. If you are thinking of retiring an old machine, check out this CNC machine buying advice.